Build Perfect Cell! 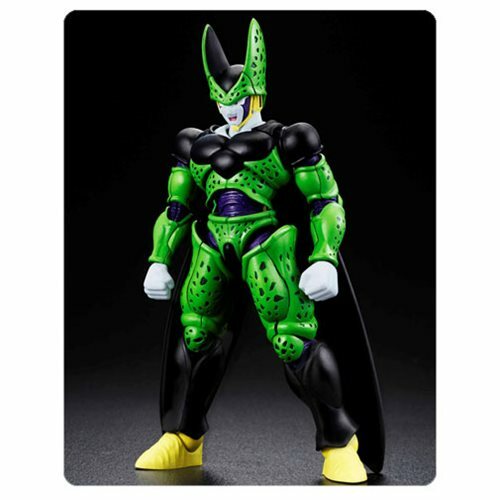 Coming to the Figure-rise standard line is Perfect Cell! Cell's distinctive body patterns are recreated through part under-layers! Using this technology, Cell's physique has been recreated using detailed designs and natural-looking moldings. He even comes with two types of face parts to make the figure that much more enjoyable! Kamehameha effect parts (charge and release) are also included. Use these accessories to recreate the epic battle between Cell and Gohan! Set includes optional "angry" face expression, interchangeable wrist, Kamehameha effect (charge x1 and release x1), and Kamehameha effect stand. Comes with 7 Runners, a Sticker sheet, and Instruction manual. Measures approximately 7 3/4-inches tall when complete. Ages 15 and up.